They come with a FAS-TRAC™ suspension, so they’re very easy to adjust. The graphics on every hat cover the whole surface, so you get a level of stunning beauty that you won’t find from many other products. 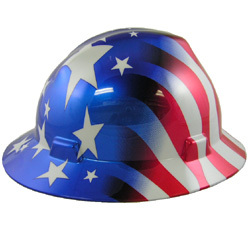 With a full brim, every MSA Patriotic hard hat delivers additional protection against the elements. You also get ANSI Class E, Type 1 safety.